AMD sends word this afternoon that they’re instituting an official price cut for one of their more recently launched video cards, the Radeon R9 280. The 280, AMD’s lower tier Tahiti part and Radeon HD 7950 analogue, was launched back in March, shortly before Cryptocoin Mania subsided and AMD video cards came back to their MSRPs. As a result of being launched in that time period, the 280 launched at an inflated MSRP of $279, suitable for a time when the higher tier 280X was well over MSRP but uncomfortably close now that AMD’s faster card is back at $299 where it belongs. Consequently AMD is cutting the price of the 280 to bring its price back in line with its performance relative to AMD’s other video cards. Effective today the 280 is getting a $30 price drop, from $279 to $249. This puts it almost precisely between the 280X ($299) and 270X ($199) in AMD’s product stack. Meanwhile a $249 MSRP also means the card is now more directly competing with NVIDIA’s GeForce GTX 760, which has a similar $249 MSRP, though can often be found for $10-$20 less. As one would expect, that is a very close matchup and it’s no mistake these cards are priced so close together now that AMD has better control of their retail pricing. Wrapping things up, AMD tells us that they expect it will take a few days for the price cuts to filter through various partners and retailers, though a quick Newegg check is already turning up two cards priced at $249 or below. 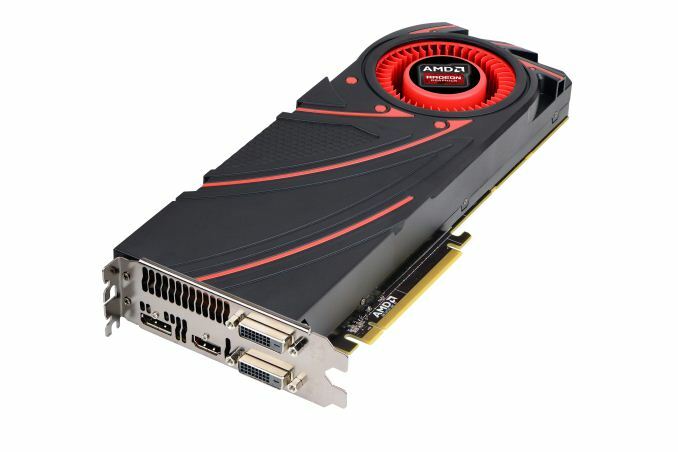 In fact Sapphire’s R9 280 Dual-X is already well below AMD’s new MSRP, with Newegg running what’s undoubtedly going to be a short-lived deal that sees the card priced at $219 after mail-in rebate, with Newegg taking off a further $20 for signing up for their newsletter to bring the final price down to $199. Meanwhile despite the price cut the 280’s status in AMD’s Never Settle Forever program remains unchanged, so the 280 is still a gold tier card that qualifies for 3 games through that program. Getting a custom-cooled 280 for 199 like the one via Newegg is crazy good. Even if prices will rise, if they stabilize around 220-230, then that means that Nvidia has no response in the space between 180 and 250 dollars, a crucial segment. Plus, the 280 has very good overclocking capability. AMD seems to have wind in their sails, after the Titan Z debacle, the emergence of FreeSync as a viable (and free!) alternative to G-Sync. They were down and out a few years ago and are now doing a lot better. Even their drivers are doing better, especially for the new 4K single stream monitors where Nvidia's drivers are now the ones falling behind. "Considering AMD is hurting a lot more than Nvidia (Nvidia's financials are well and good) I'll take another 8 months to 20nm/Pirate Island/Maxwell of AMD dominating in pricing." Yes I read all the reports. Pay attention to more than just revenue. Margins, etc all come into play here. Also consider what they've been doing with their money. IE, buying back stock in NV's case and giving dividends. There is a lot more to a financial story of a company. I could write a book here, but you hopefully get the point. One number out of an earnings report doesn't tell you everything about company X. You kidding? There is a $250 card in the chart called GTX 760 which as he noted can be had for $20 less than $250. Did you read the article? No debacle for Titan Z. Just a realization the other guy got his stuff running at a ghz, so you have to up the clocks from 876. Big deal. At least they didn't ship cards to reviewers and tell them all to re-bench with new drivers that ups the fans so they can run at retail clocks (290), or ship cards that can't do RETAIL clocks as your ref cards so places like tomshardware etc were posting ~750mhz throttle stories. THAT, was a debacle. Who told you freesync is free? It takes a newer card, GOOD AMD drivers (uh oh), a new monitor which also requires new SCALERS which were not made at the time NV went Gsync (and exactly why they did it on a chip themselves) and still not made for desktop monitors apparently etc. Also you naively think monitor manufactures won't charge for this tech that at least requires some R&D (scaler has to be upgraded, that's R&D for someone and they won't give it away). Let me know when you've seen freesync working in a shipping product and that it is just as good as Gsync. NV is falling behind in 4K single stream monitors? Pretty specific situation to get a win for AMD (reaching a bit aren't we?). So >1% of the market is a death spiral for NV? NV's fortunes? Well they make a fortune compared to AMD already with NV making ~450-650mil/yr vs AMD still losing every year(lost 83mil 2013, lost 1.18B 2012). Remember AMD has to make money for the YEAR. Let me know when they get that right again. They have to make 200mil just to pay interest on their debt. NV pays no interest. In the last 10yrs NV has made ~3.5B. AMD has lost $6B+ during that same time. Two small losses in 10 yrs amounting to 100mil or so due to paying bumpgate stuff probably. The company has never made a dime over it's whole life. Not quite sure how you do that and live but the point is the same. Hopefully AMD's fortunes will return but I really doubt it. Everyone is coming for the bulk of their market (low end crap apus etc), and NV already owns 65% of the discrete gpu market. NV brags every quarter about GRID tests. They had 100 companies 2 quarters ago, 200 testing last quarter and 600 companies testing this quarter. Where is AMD bragging? Will NV own 90% of the grid market soon like workstations too? So NV in two NEW markets that are growing (an making companies massive profits on mobile) while AMD still trying to get into them. Let me know when AMD shows a path to some massive TAM that breeds profits. You should be worried about AMD not NV. NV has 3.5B in cash and basically no debt. AMD 1B and 2.5x that in debt last I checked. You failed to mention AMD has no mobile soc for 2yrs that even looks like it has a chance against everyone else and they won't wait for AMD. AMD won't have exploding profits with x86 or gpu on PC's. The new money is being made in MOBILE (and at some point GRID type stuff). IF you're 6yrs late to that party you aren't in a position to dominate and may not even be in the position to grab market. AMD will have to have a BETTER product to take out Qcom or NV in that landscape and it seems they're way behind. I am all for getting the best bang for the buck and there is no denying that AMD cards are hard to ignore in many price range's, but by no means is AMD doing well. They are on the verge of total bankruptcy and this move is one of many they HAVE to do to stay afloat. They already announced this past November they are terminating desktop CPU's for the next 3-5 years. This means no FX based Steamroller and Excavator's. They will only be focusing on Desktop/Laptop APU's and a few server Opterons.